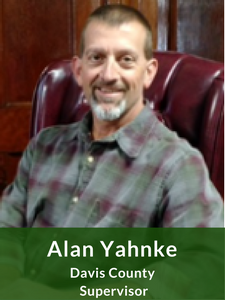 Alan Yahnke serves on the Board of Directors at Pathfinders RC&D and is a Davis County Supervisor. He is one of our newest members, joining the board in the first part of 2017. For 30 years, Alan worked first in Fairfield and then the Eddyville community before deciding it was time to become active in his own community of Davis County as well. Alan was born and raised in Davis County, where he and his wife, Melissa, raised their four children. He is a full-time farmer with approximately 90 head of cows, and when that doesn’t keep him busy, participating on his community’s many boards certainly does. The Davis County Board of Health, the A. D. L. M. Counties Environmental Public Health & Facilities Management Systems, and the Davis County Fair Board are just some of the boards that Alan serves on in addition to ours. As a Pathfinders Board member, he’s been thrilled to see our projects enhancing his hometown. 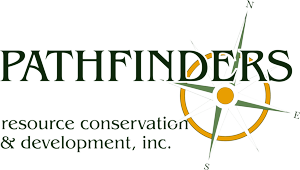 “Pathfinders wrote grants for the new library in Davis County, and you should see it now. They also wrote grants for the Davis County Trails System which is now in Phase 2 of 3.” Alan loves serving the relaxed, good people of his small community.